Governor of Poker 3 multiplayer poker app offers the more skilled poker enthusiasts with different poker variants in a level playing field. Nonetheless, the game furnishes newbies with low stakes cash games in which to harness their skills until they gain experience points (XPs). That way they can optimise their bankroll, while grinding in tables to gain XPs for attaining higher levels and eventually, unlocking virtual venues where they will be able to play for higher stakes. 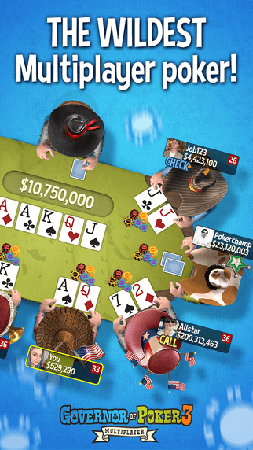 The third in a series of Governor of Poker multiplayer game apps released by Youda Games, this GOP 3 app is the only free to download poker app to offer Push and Fold No Limit Texas Hold ’em poker. Live players at the table could push their opponents to raise their bets or force them to fold, based on the strength of their cards. Beginners should understand that the more skilled poker players could also use the Push/Fold strategy to bluff their way toward winning the pot money while holding a pair of bad cards. This poker app has a special blackjack feature in which the betting range also depends on a player’s XP level. Carried out as a single-player game between the GOP 3 card dealer and the app player, it requires the dealer to stand at seventeen (17), and pays more than double if a player instantly hits a blackjack with the first two cards. Governor of Poker 3 is available to download as a free app at the Apple iTunes App Store and the Google Play Store. iPhones and iPads require iOS versions 7.0 and up, while Android smartphones and tablets are app compatible only if the device runs on 4.03 and later versions. Immediately upon installation of the GOP 3 app, all new users will have to start their poker adventure at the Poker Shack, located in the Beginner’s Lake area. From there, gain XP points needed in order to level up and unlock other gaming venues where the buy-in fees and the blinds are higher. Quite interestingly, players observe a dress code by wearing a hat. Since new app users still have to work their way through levels in order to earn gold coins for buying a hat, the only selection available to them are the cheapest and the not-so elegant kinds of hat. They might find a need to buy the fashionable or the flashy styles later, as some of the high-stakes poker venues not only have a dress code but also a color motif as well. GOP 3 app users looking to play challenging and intense ring games and tournaments would probably find their match in the Pro-Forrest and the in Millionaire’s Row, where the stakes and the ante are in millions. GOP 3 players need not worry if they run out of playing chips because aside from the initial stack, the game also supplies a set value of chips every three hours. The values gradually increase whenever a player reaches a corresponding XP level bracket. Players are also rewarded with thousands of free chips every time they level up, as well as receive gold coins and trophies for completing different achievements and missions. App users who connect and sign-in to GOP 3 using their Facebook account receive $5,000 worth of additional free chips. Inviting a friend to join in the live poker games by downloading the GOP 3 and/or watching video clips of other game apps are additional ways of earning more chip rewards. GOP 3 also furnishes Cash Games as well as Sit & Go Tournaments with buy-in fees that match a player’s bankroll level. That way, they can re-build their bankroll or extend their playing session by engaging in low cost, low stakes games. A nice touch to the GOP 3 app is Cash Game available at the Rookie Dessert. It accepts up to Level 13 players only, which is one way of making sure that High XP players will not take advantage of the less experienced participants seated at Cash Game tables.